Some time ago I wrote o post on several animals described in medieval bestiaries (available HERE), and now I would like to get back to that subject. Today I will focus on one particular beast: a unicorn. A unicorn was a mythical creature quite often depicted in medieval art. It was supposed to be pure and signify Christ. Most often it was depicted as a horse (or a donkey, or a goat) with a singular horn on the top of its head. 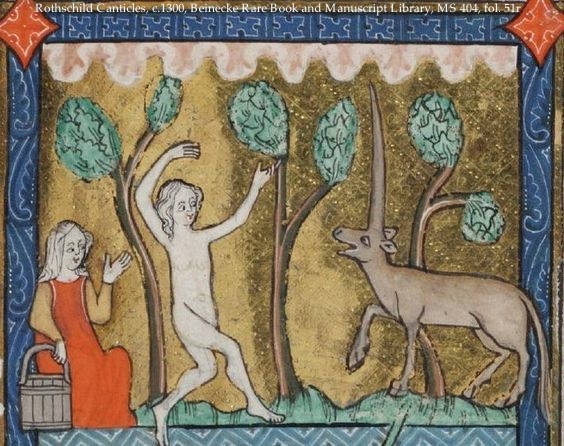 Interestingly, some medieval bestiaries also describe another (although similar) creature called monocerus. That one was particularly weird, as it was described as having the head of a stag, the body of a horse, and the feet of an elephant. But let’s focus on a regular unicorn. As said above, unicorn was related to purity and as such was an attribute of virginity. 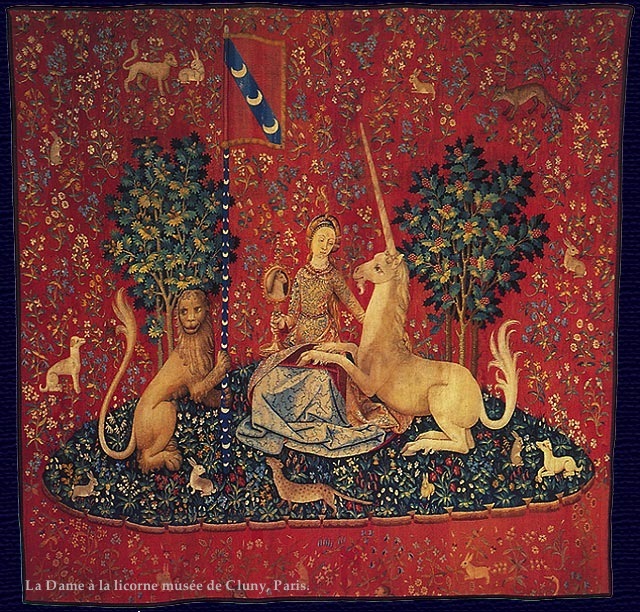 It could have been included in portraits or allegorical depictions; for example, there is a very famous set of tapestries, called The Lady and the Unicorn, believed to represent the allegories of five senses (early 16th century, Musée Cluny in Paris). 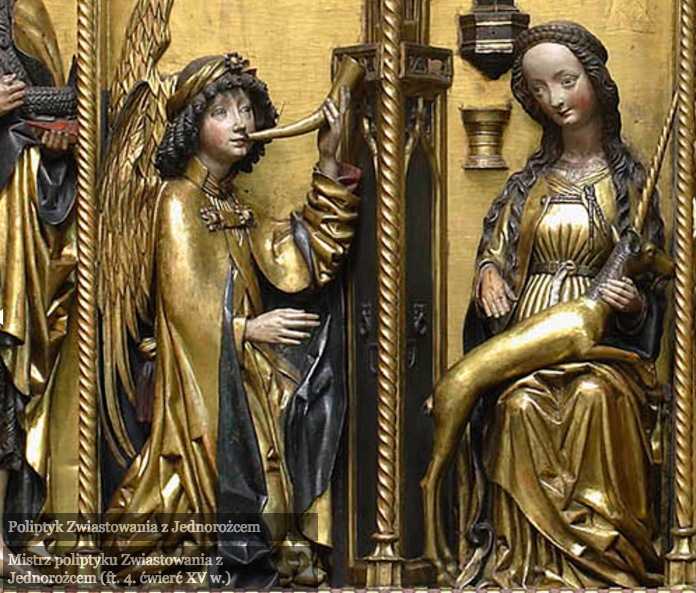 On the other hand, a unicorn may have been included in the depictions of Annunciation as a symbol of virginity of Mary – a very fine late gothic example is an altarpiece now in the National Museum in Warsaw (last quarter of the 15th century, from St Elisabeth church in Wrocław, Silesia). 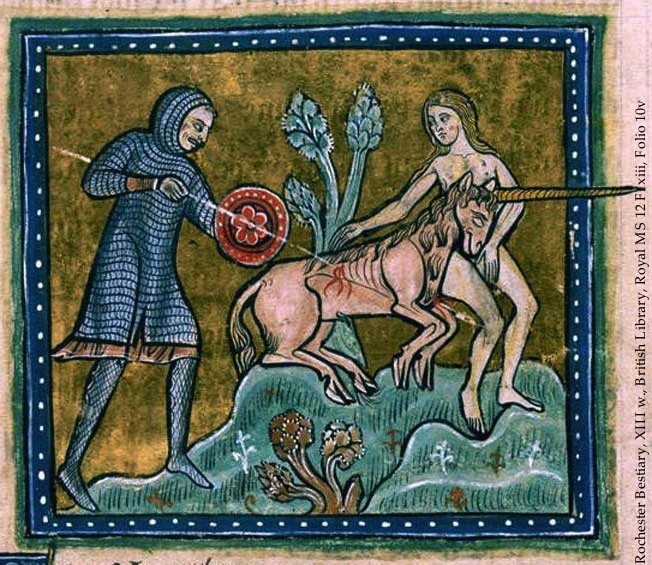 Ladies were in general associated with unicorns which had to do with the way a unicorn may have been captured. It was not easy at all, as you could not just simply catch a unicorn. You had to trick it first and to do that you needed to have a virgin to help you. 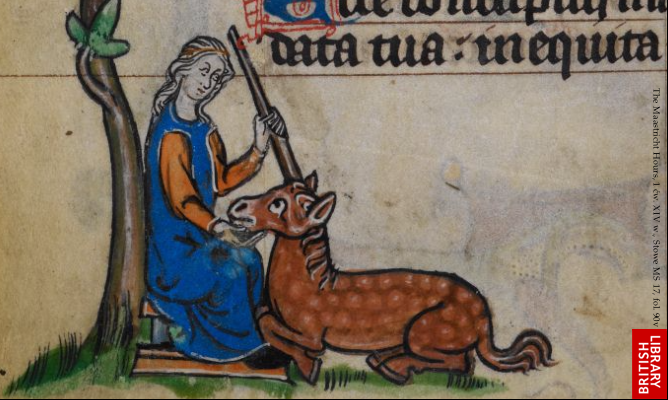 So first, the virgin should go to the woods where a unicorn may be. Then she sits and waits; the unicorn will soon detect her purity and come to her and put its horny head in her lap. According to some texts, the girl must bare her breast and allow the unicorn to suckle; anyway, in the end the beast simply falls asleep. Then the hunters may easily capture it. But why capture a unicorn in the first place? Well, it was its horn the hunters were after. It was said to be magical, useful for various potions, and also a poison… but mostly it was supposed to be an aphrodisiac! That is probably why the virgins were so eager to get it. Well, at this point we may paraphrase an old joke about a carrot: “Unicorn’s horn may help you with erection… it is only difficult to attach”. But how joyful it turns out to be when you succeed with it!